After we said goodbye to the busy city of Bangkok, we welcomed the sight of almost abandoned roads, palm trees, rice fields and the buffalos grazing upon them. 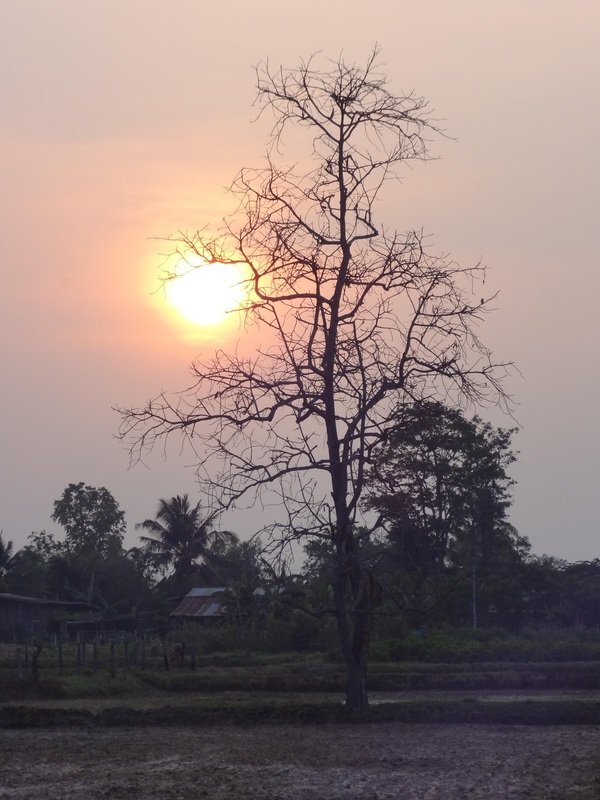 We were back in Isan. And now the time had come to focus on our ‘IP’, guiding pupils through two weeks of English Camp. 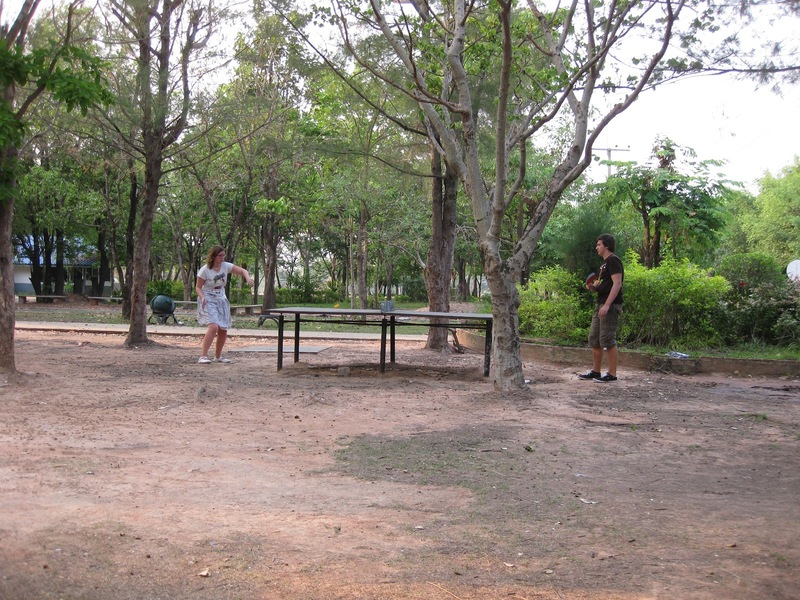 During these two weeks we stayed at P’Boom’s house. She is a 26 year old mother with an 8 month year old boy, Fork. She lives in a big and quite modern house so we had no difficulties adapting ourselves to our new host family. In the evenings we sometimes went for a walk in the neighborhood to witness the beautiful sun setting on the deserted rice fields. When we arrived at school, the first thing I thought was that this school isn’t really that different from the school we taught at in the beginning of our journey. Low buildings with no doors or windows, a lot of trees and grassy perks and of course, everywhere you look you see friendly and enthusiastic pupils greeting you. Since we didn’t know the level the pupils it was difficult to create fun and challenging activities while preparing our ‘IP’ in Belgium. 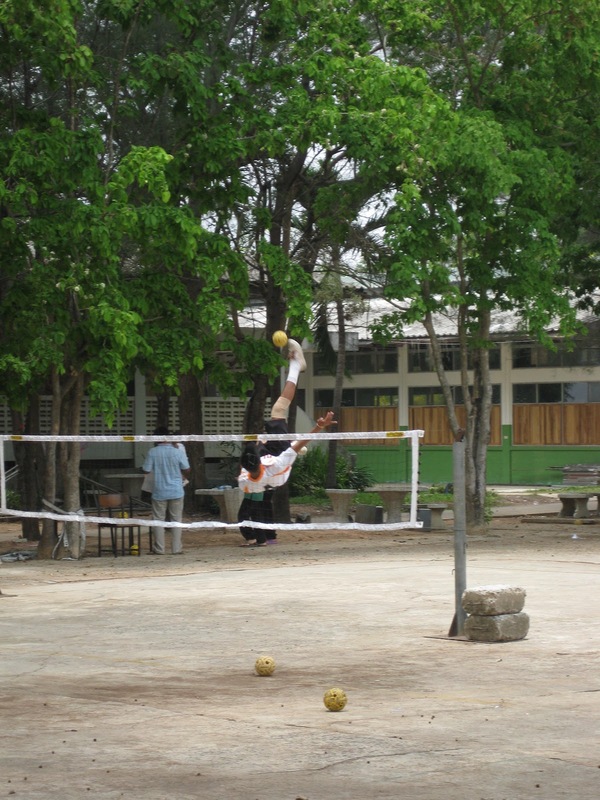 We quickly came to realize that our games and lessons were far too advanced for the pupils. 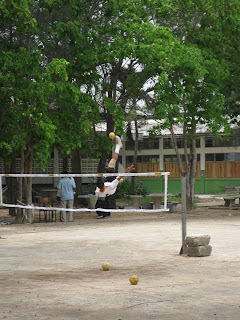 So we spent night after night adapting our activities until we were sure the pupils would think it fun and interesting. 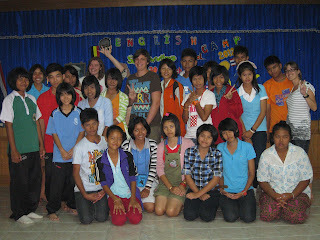 At the start of the English Camp we were a bit let down because only 14 pupils turned up. Then again, the next day this number was reduced to four...This was because the school was organizing an open house for pupils of the elementary schools who could come and check out their future school. The first week went very smoothly and as the week progressed we noticed some big changes in some pupils’ attitude and level. We played a lot of games, had some lessons about telling the time, taught the pupils how to conjugate some new and difficult verbs, drilled on the fact that they have to pronounce the final sounds of words and much more. We also gave the assignment of creating a booklet in which students could make a mind-map about English Camp. Our top three would get a prize at the end of the week. We were looking forward to receiving these booklets because in general, Thai pupils are very creative and tend to put a lot of work in arts and crafts. In the weekend we kept ourselves busy preparing for the upcoming week op English Camp and we didn’t really do anything noteworthy except taking a few walks in the rural part of “town”. During the second week we noticed the pupils were progressing quite ‘fast’ (for Thai standards that is) and we, being the ones who made this possible, felt proud. It was also in this week that we decided to have reading session. Each of us handled a different book each day and we worked with set groups so we could deal with the problems of 6 or 7 pupils instead of an entire group. As the reading sessions advanced we noticed the pupils were gaining a lot more confidence and actually started to enjoy the stories they were reading. Mission accomplished for that matter. On Thursday we told the pupils that they would be acting in a movie on Friday. They were all very excited and were therefore very enthusiastic while playing the acting games we provided them with. After these games we did a couple of teambuilding exercises which they really enjoyed. Mark my words: it’ll be hard once we are back in Belgium, where pupils prefer to run away from you than greeting you and acknowledging your existence outside the school’s premises. 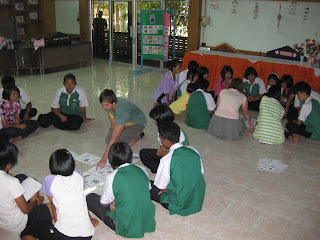 Now that the English Camps are over, we move on to a new chapter of our trip: the University of Rajamangala in Surin. What we will be doing there? No idea. Exciting isn’t it?